You will need: Sixteen metres of 75mm x 50mm H3.2 rough-sawn pine, eighteen metres of 50mm x 25mm H3.2 rough-sawn pine, pack of 50 10g x 100mm countersunk screws, pack of 100 8g x 50mm countersunk screws, power saw, power drill, sandpaper or sander, paint, paintbrush, clamp and woodfiller. 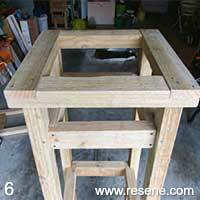 2 litres Resene Lumbersider Resene Mantis. 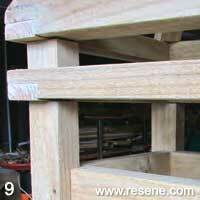 Cut half lap joints on each 480mm length, cutting an indent the same width (75mm) and half the depth (25mm) of the pine. 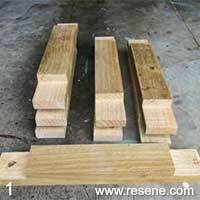 Cut half lap joints on the ends of each 330mm length, cutting an indent 25mm x 25mm, as shown. 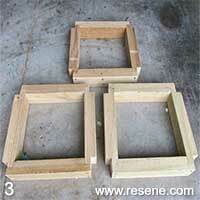 Using 50mm screws, join the 330mm lengths to make three square frames, as shown. There will be indents on each corner. 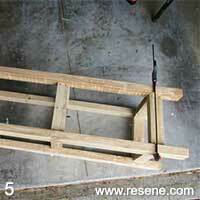 Join the 480mm lengths to form two more frames, as shown. 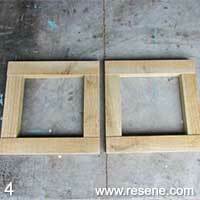 These are the frames that sit near the top of the obelisk. Fix the 1500mm lengths to the three frames, with one frame 120mm from the top, one frame in the middle, and the other frame 150mm from the bottom. 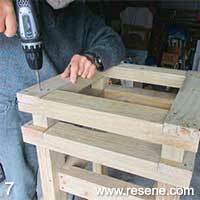 Using the 100mm screws, fix one of the 480mm long frames to the top of the obelisk, with one screw at each corner. 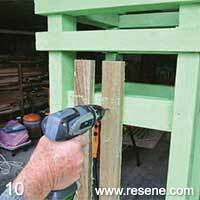 Place the 50mm blocks on top of the frame in line with the 1500mm lengths. Screw, then fix the second 480mm frame on top. 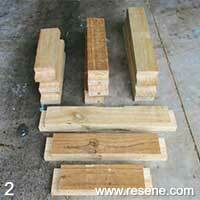 On all 420mm and 400mm lengths, cut angles of 50° on one end and 40° on the other. Screw to top of obelisk. Sand corners. 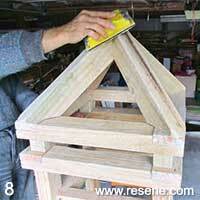 Fill any gaps with wood filler. 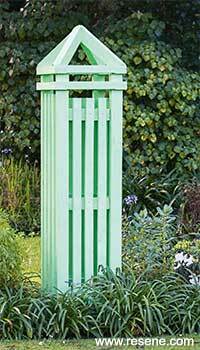 Apply two coats of paint to the obelisk and to one side of the 1400mm lengths. Screw the 1400mm lengths onto the obelisk, three per side. Then finish painting.